A Marine and his brother have both been awarded medals — one for combat and one for athletics. Gunnery Sgt. Verice Bennett’s brother, Ashton Eaton, was awarded the gold medal at Olympic Stadium in London on Thursday for his performance in the decathlon. He accumulated 8,869 points in the two-day event that includes 10 grueling tasks like the high jump, the long jump and various races. Bennett, 34, watched his brother compete from Virginia where he works at Manpower and Reserve Affairs at Marine Corps Base Quantico. He said he couldn’t be more proud of his little brother. Life is interesting having a brother who breaks Olympic records, Bennett said. When visiting Bennett’s son’s school, Eaton showed the kids his high-jumping skills and was suddenly about four feet in the air. Both brothers have busy schedules. Bennett said he follows Eaton’s career as much as he can through his deployments and they visit in between his tours and his brother’s training. Gunnery Sgt. Verice Bennett was awarded the Silver Star in Dec. 2011 for actions in Afghanistan in 2010. One of those visits took place around a different kind of medal. 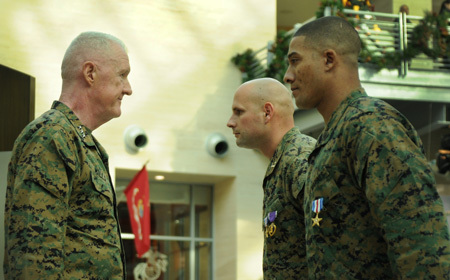 Bennett was awarded the Silver Star in Dec. 2011 for actions while serving as platoon commander for India Company, 3rd Battalion, 7th Marines, in Afghanistan in 2010. On Sept. 13, 2010, his company came under fire from more than 100 Taliban fighters. Bennett managed his Marines, braving firefight in order to repel enemy advances for more than 10 hours. Eaton, 24, wrote about watching his brother being presented with his medal on his blog. “Until now I didn’t know what gravity it held to hold the American flag at something like the World Championships or Olympics,” Eaton wrote of his brother’s Silver Star ceremony. Bennett said the feeling behind the medals is so different, because one can dream of earning the Olympic gold, but one doesn’t really dream about earning a Silver Star. There are different sacrifices behind them, he said. I do not know what exists in the Bennett gene-pool?!! Gunnery Sergeant Bennett is a ball of motivation and professionalism so refreshing to see in a SNCO it’s startling; then to find his brother is a specimen of extreme physical prowess speaks volumes about the both of them and their family. I wish the Gunny all the best as he takes off for his new assignment too. V/r WJH CWO3 USMC Ret.